The notion of designing a vessel from a luxurious interior out doesn’t sit well with me, but this is likely the situation with most new sailboats today. In aircraft builds an approach called Lean is followed. This means that base functionality is engineered first before creature features (features that are intended to get a customer to buy). The Lean configuration is then enhanced in a give and take with dealerships. It is instructive to review how Macgregor 26 sailboat production runs are examples of Lean Manufacturing. 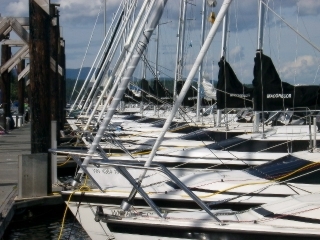 Prior to launching the first of Murrelet’s kind (the first Mac26X), MacGregor Yachts produced three Mac26 sailboats (each with different keels}. A Mac19 powersailer was also produced, and many designs were prepared, most with layouts that are traditional for cruising sailboats. This process is considered a radical progression in boat design. MacGregor Yachts was not the first boat company to apply the rapid design or Agile approach (common in software engineering) to boat building. Sadler built 300 Sadler 25s in the 1980s with different keels before producing the Sadler 26. [Sailing Today March 2001]. Reviewers applied the term “quick an dirty” to Roger Macgregor’s Mac26 production lines. [See Practical Sailing November 1987]. (The term Lean Manufacturing was not yet invented.) Macgregor Yachts rolled out the Mac26 classic daggerboard sailboat at this time but, like Sadler, continued to offer different keels. Reviewers pointed out that the “quick and dirty” term did not imply poor value. It was meant to impart the notion to buyers that each vessel got the same amount of attention on the factory floor. What might be called sloppy work by a craftsman was hidden with liners and finishing. Cleaning up sloppy work was not of value because that was inefficient. Instead workers would do better on the next boat. It wasn’t until the launch of the Mac26x that reviewers dropped the quick-and-dirty tag line. (See Practical Boat Buying 2003 by Belvoir Publications, Inc. page 141). By this time, Macgregor Yachts had become the largest cruising sailboat producer in the world. Designs were done using CATIA, the same computer aided design CAD software used at Boeing and Ocean Race boat design firms. All lines but the Mac26x production line were shut down. This included the Macgregor 65 foot line. One Mac26x was produced every two hours. Possibly to avoid the quick-and-dirty reference, the Mac26x had unfinished storage compartments so that the quality of the hand laid fiberglass could be readily observed by craftsmen. In 2003, after boat 4,000 had been launched, Roger MacGregor boasted “We have the neatest, most tightly controlled plant on the earth, and these boats aren’t failing.” 7,000 of the previous traditional (not powersaler) models had been produced. In Lean Manufacturing there is recognition that no production line is sustainable. That means that eventually the line must be shut down and workers deployed elsewhere. At around hull number 6000, Macgregor Yachts decided to introduce the Mac26m. This model has the look of the first Macgregor powersailer (the Mac19). Likely so that the new 26m model need not compete against the still in demand 26x model, production was halted on the mac26x line. There may have been other reasons for the production halt. The Mac26x water ballast system is similar to ocean racing water ballast systems. This means that the vessel is designed to be sailed with or without water ballast and raced with risk of capsize. All other MacGregor 26 models, including the Mac26m, are restricted to fully ballasted operation when under sail. and there is little risk of capsize because of that. The Mac26m was not designed to be raced and references to racing do not appear in brochures for that model. As one might expect, the M model came with creature comforts exceeding that of the designed for racing and hence spartan X model. When fully ballasted the X model can be bettered by a Mac26m. But the Macgregor 26X operator can move the water ballast off the boat and then there is no contest. It is possible that the Mac26m, launched in March of 2003, was designed for the most part prior to the Mac26x launch in 1996. In other words, one might consider the M to be the second generation powersailer, though in chronological order she is the third. This is supported by at least one physical model that is known to exist for the M.
Prior to computer assisted modelling (CAD), it was standard procedure to create physical models for distribution to boat reviewers and to analyse during the manufacturing process. The building of such models is not necessary with CAD. According to a Boeing CATIA engineer, interviewed in March of 2015, physical model building is “old school” and, in Lean Manufacturing, no physical models are made because there is no “value add”. Additionally, Boeing tries to limit printouts of designs because the 3D computer renderings make such printouts of questionable value because they may be out of date. The photo is an example of a physical model at the MacGregor Yachts factory. 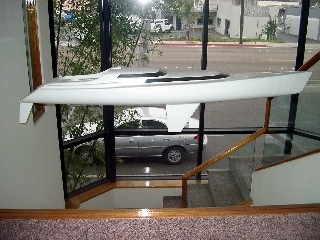 Typically different foil and stern configurations would be created for such a model. The 26M combines features of the Mac26D (Classic Daggerboard) and the Mac19 with a rotating mast like is common in multihulls. The exterior of the 26M also is more sailboat like, sleeker and better looking by even my eye than the form of the 26X, though the 26X form is more functional. The interior is lavish, this coming at the expense of cockpit size. By the end of 2003, Sail magazine, in the 2004 Sailboat Buyers Guide, noted that only 300 Ms had been produced. This was one third the number estimated by others, including myself, and not representative of the kind of success needed to justify the halt of Mac26x production or the claim that the 26M is a replacement for the 26X. Volker and Gerda Lamprecht, the German home interior design couple, and X dealers, gave birth to the Oden 820 and may hold bragging rights for a powersailer that was to be a replacement for the X. I seriously doubt that interior designers can – on their own – design a vessel that both powers and sails well. Hence, I suspect that Roger MacGregor was part of their design team just as he has been reported to have been part of the team that developed the M. Unfortunately both the M and the Oden 820 are not meant to be sailed unballasted. The term to be used in describing this kind of a sail boat is a fixed water ballasted sailer. The X is a movable water ballasted sailer. The movement is on an off the vessel. Unballasted operation for the Oden 820 is reserved for motor only operation and shortly after the introduction of this vessel in the US (as the Mast 28), safety restrictions regarding the M motoring unballasted were removed as was the odd notation that while the vessel could sleep six the maximum crew size was four. The 26X is engineered to both motor and sail unballasted, sleeping six and carrying up to 10 (by PHRF racing rules – no manufacture limit was ever established) (see video). Like the Oden 820 the X has a sailboat planing style (likely Dribbly) hull form. The M has the powerboat V form favored in sport power cabin cruisers. If the deadrise were just two inches more the M would – with out a doubt – be a sport power cabin cruiser competing directly with Bayliners. In its first year of operation an Oden 820 suffered a capsize with 9 thousand british pounds of damage, likely to the posh interior, yet she is very much in demand and US and Mac26x dealerships now sell both Mac26m and Mast28 vessels. Like the Mac26x, the Oden 820 can be fitted out with 70 hp engines. The M owing to its captain’s seat requires a modification to support a 70 hp and has the stability or hull form needed to make effective use of the more powerful engine. Dealers in the US sell the Mast 28 for 45,000 US which is comparable to a power boat with similar accomodations or a trailer home. The Mast 28s are CE marked which has been estimated by one Mac26m dealer to be worth at least $10,000. CE marking allows boats to enter EU waters with out threat of confinscation or need for exemption. In March of 2003, MacGregor introduced the all new MacGregor 26M, to replace the 26X that had been in production for 7 years. Approximately 5000 of the X had been produced before being replaced by the M. The new boat is substantially different from the old. The following is a summary of the changes. Looks are subjective, but we are getting a lot of feedback that the new 26 is one of the best looking trailerable sailboats ever built. It has a more traditional shear line, and the dark blue hull is a knockout. It really stands out in a boat show or at a marina. The dark blue hull is an option, and will cost extra. The white hull, with black stripes, just like the 26X, is standard. The transom, with its smaller opening and rounded corners, makes a big improvement in the view from the rear. Much of the rudder system is inside the boat, offering less clutter on the transom. The good looks came at a fairly small price. The transom opening is smaller and not quite as easy to pass through. The boat looks a lot longer, and the taller rig gives it a more traditional sailboat look. The sliding hatch, rather than just sitting on the cabin top, contours to the deck. When it is open, there is no gap between the deck and the hatch leading edge. The new hull has a deeper V bottom (15 degrees), rather than the flatter bottom of the older boat (8 degrees). The purpose of the deep V shape is to give the boat a softer ride under power, with less slamming against choppy seas. It also provides a moderate reduction in wetted surface, which benefits the boat’s sailing ability. The V bottom has softer corners at the transom, and, at typical angles of heel, the corners dig in less and create a less turbulent wake. The deeper V bottom keeps the boat from sliding around on the trailer, and gives better tracking under power. The more pronounced centerline ridge provides a stiffer hull bottom. The new boat is significantly faster under both power and sail, and quite a bit faster under main alone. We compared two identically rigged and loaded boats, a 26X and the new 26M, both equipped with 50 hp Mercury Bigfoot engines. At identical rpm settings, the new boat had an advantage of approximately 2 to 3 mph. This advantage held over a wide range of speeds. It held in both calm and choppy water. The big reason for the higher speed on the new boat is the lack of centerboard trunk drag. When we studied the videos of the speed runs, the turbulence from the 26X centerboard trunk was clearly visible, while the new boat offered a really clean water and spray pattern. The old centerboard trunk carried along about 100 lbs of water, the new trunk, with its tighter tolerances, carries virtually none. The 26X, boat, with its flatter bottom, was slowed each time it came down hard off of a wave. Both boats showed an equal ability to get up on a plane. Under sail, the differences were striking. In all conditions, the new boat had a major speed advantage. The taller rig, reduction of the drag from the centerboard trunk, and the rotating mast really paid off. I believe that it will prove to be the fastest trailerable boat we have ever built. The most striking difference in speed was when both boats were sailing with main alone. In typical conditions, when the 26x was sailing with main and jib, it was going about 5.7 mph. When the jib was furled, the speed dropped by 2 mph. With the new boat, when the jib was furled, the speed dropped by only 1 mph, with little change in the balance of the boat. This means that an owner can go out for a sail and forget the jib, and still get good performance. In high winds, the main alone is an excellent choice. The new boat is less likely to get in irons when tacking with just the main, and if it does, it is far easier to recover. It balances almost as well with the main alone as it does with the main and jib. Since the front third of the main is now working, and not screwed up by the turbulence of the mast, the thrust is now forward, rather than to the side. The result is more speed and less heeling angle. When the mast is properly rotated, the boat comes alive. When the mast is centered, the boat slows measurably. Better performance is the big reason for the change. Here are a lot more reasons. A centerboard trunk presents a 16″ high problem from the mast almost back to the steps. Unfortunately, this ridge dominates the interior plan, and made it essential to bring the seating structure on one side out beyond the centerline. This forces a dinette type of configuration, which makes it more difficult to have a good conversational type seating for a bunch of crew members. It also reduced the interior floor space (and thus moving around space) by a significant margin. The daggerboard trunk, which is partially hidden by the galley, eliminated these problems. The daggerboard trunk takes the full downward thrust of the mast to the keel of the boat. The daggerboard requires a much smaller opening in the hull, which helps reduce drag and keep structural weight down. The daggerboard requires no metallic parts below the waterline. There are no holes in the hull to leak, or pins to wear. The retraction cable is less subject to wear, and it can be easily replaced. The board itself can be lifted out through the deck for cleaning, inspection or repair. Removal of a centerboard is a tougher job. 5. QUIETER AT AN ANCHORAGE. Daggerboards are a lot quieter and subject to less wear when the boat is moored or at anchor. 6. THE BOAT CAN SAIL WELL TO WEATHER WITH THE BOARD PARTIALLY RETRACTED. With a centerboard partially down, the center of pressure moves aft, and the boat gets a lee helm when sailed into the wind. With the daggerboard partially down, the fore and aft center of pressure does not change, and the boat continues to balance well. This helps when trying to sail the boat to windward in shallow water. For reaching, the daggerboard can be partially retracted to kill off weather helm, in the same manner as the centerboard. When reaching, you do not need the full lifting power of the board, and the partially retracted board works fine. The down side, of course, is that if you hit something, the boat will come to a stop, just like any other keel boat in the marina. At normal sailing speeds, there should be no problem. The board is strong, and the hull is stronger. Don’t, however, leave it down when powering fast. The 26’s rotating mast is similar to the setup used on modern catamarans. We have developed a system (for which we are seeking a patent) that allows conventional spreaders, with upper and lower shrouds, and a mast that rotates to good airflow across the mainsail. 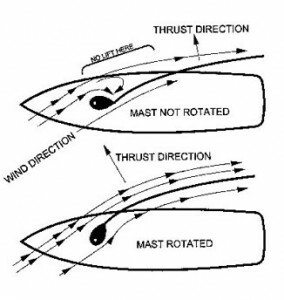 With a conventional non-rotating mast, the mast creates a serious amount of turbulence on the mainsail, making the first third of the sail virtually useless. The deep notch between the mainsail and the mast disturbs the laminar flow of air across the downwind side of the sail and causes the smooth air flow to separate from the sail and disintegrate into a vast field of turbulence. The drawings below show the difference. With the rotating mast, the boat heels less and goes faster. The mainsail can now be used as the only sail for comfortable effort-free day-sailing. When the wind kicks up, getting rid of the jib and keeping the mainsail retains really good performance, and makes sailing a lot easier. The mast section is larger (fore and aft) and does not require a backstay. This reduces weight aloft, and reduces windage. The rotating rig raises and lowers like a non-rotating rig, and requires no attention when sailing. As the boat tacks, the mast automatically adjusts itself to the proper angle without human intervention. 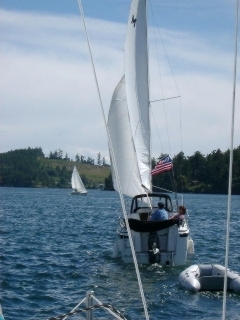 When raising the mast, there is no backstay to tangle up in the rudder system or outboard motor. The mast is 2’ taller, giving a bit more mainsail area and a better looking rig. The mast is sealed with injected urethane foam, and acts as a powerful buoyancy chamber if the boat is knocked down. The 67 pounds of buoyancy provided by the mast is equivalent in righting power of adding 500 pounds of ballast in the bottom of the hull. This multiplier is the result of having the center of buoyancy of the mast a long way out from the center of buoyancy of the hull. We have beefed up the chainplates, bow plate and all mast hardware, and the rig looks strong and efficient. The chainplates have a stainless deck plate welded to them. These plates bolt to the deck, reducing the chance of a leak. A small tube will be cast into the mast flotation foam to allow the future passage of wires to the top of the mast. The rudders are larger than those on the X, and have a more efficient elliptical tip. With the deeper V hull, the upwind rudder is less likely to be raised out of the water when the boat heels. With the deeper V on the new boat, the transom corners don’t dig in as much when the boat is heeled over, and the wake is a lot cleaner. This means less drag. With the new hull and rudder shapes, the boat has less tendency to round up into the wind when heeled far over. To enhance stability at lower heel angles to make up for the V bottom, we have added a permanent ballast of 300 pounds inside of the water tank. The ballast is in a sealed container surrounding the daggerboard trunk. The ballast is bonded to both the hull and the trunk, giving the trunk a great deal more strength. The 300 pounds of permanent ballast replaces an equal amount of water ballast, so the removable water ballast amounts to 1150 lbs. Total ballast is still 1450 pounds. The new boat is about 200 pounds heavier in its trailering condition. We have added an extra layer of fiberglass mat and roving to the underwater area of the hull. This adds about 120 pounds, and adds to both stiffness and stability. The deck has more beams, between the liner and the deck, and feels stiffer under foot. The cockpit seats are about the same length as those of the 26X, and slightly wider. The seat area across the front of the cockpit (where the mainsheet traveler is located), gives more seating area, but reduces the footwell floor area. To make up for the loss of foot room, we have mounted the pedestal on a stainless steel column (4″ in diameter). This replaces the large fiberglass box that went all the way to the floor, taking up a lot of foot space. The footwell is narrower, to allow more room in the big berth underneath, and gives a better spacing to brace your feet against when the boat is heeled over. The steering seat is similar to the one in the older boat, but is about 6″ higher. This allows room for the outboard motor to be under the seat, rather than behind it, and puts the captain up higher with a better view over the cabin top. The cockpit cushions are improved and more comfortable. The inside sofa seat back cushions can be used, when sailing, as cockpit seat back cushions. By placing the outboard motor under the captain’s seat, instead of behind it, we were able to move the entire cockpit to the rear and add about 15″ to the length of the cabin. Improving the rear berth was a major design goal. By shortening the footwell in the cockpit, by running the seats across behind the cabin entry, we were able to provide much more room in the rear berth, and make it a lot easier to get into. After a good sail, it is highly desirable to have a place where the crew can comfortably sit, preferably facing each other, with a good table between them to hold the drinks and goodies. On the 26x’s starboard side, the dinette and the head made this a bit more difficult. On the 26X, the galley blocked seating for most of the port side of the boat. With this new sliding galley, 4 people can comfortably be seated on each side of the boat, and be in a position to have a good conversation. That many people in a small boat is a bit of a crowd, but it will work. The main salon seats are more like comfortable sofas than the seats found in most sailboats. The seat cushions are 5″ thick, and the seat backs are thick and comfortable (the seat back cushions can also be used in the cockpit). The upholstery is top grade vinyl that has the feel and look of soft leather. The V berth and rear berth cushions are covered with an attractive fabric. The boat sleeps 6; 2 on the V berth (which is a bit small), 2 on the rear berth, and one each on the cabin seats. Again, this is way to many for a happy voyage, but it can be done. We have long been criticized for having rather Spartan, refrigerator like interiors. No more. The hull sides are upholstered in durable fabrics, providing a softer, warmer appearance. The fabric also does a lot to quiet the boat. Replacing the hard liner with fabric sides knocked out a considerable amount of weight without any reduction in strength. This also lowered the center of gravity and added to stability. Headroom is a full 6 feet under the closed sliding hatch, and 5’ 10″ under the cabin near the galley. Headroom is also increased over the rear berth. Raising the bottom edge of the cabin entry not only made the rear berth more accessible, but lessened the chance of flooding the cabin in the event the cockpit was filled with a severe following sea. We also made the side decks wider, making it easier to get to the foredeck. The height of the toe rails on the cabin top have been increased. The two rows of windows give a lot more light inside, and greatly improve visibility. (However, on the down side, the forward view is more restricted as a result of the forward head.) The windows are flush mounted, and thicker than on the 26X. The galley and all doors give the look of varnished mahogany. All doors, bulkheads, windows, galley faces and hatches are cut with a computer controlled router, and are accurate to within 5 thousands of an inch. The interior is now better looking, better built and more plush than anything we have offered before, and better than anything offered by of our competitors. The galley top and sink are produced by a rather exotic process that gives the look of Corion. You will really like this. We are using a much higher quality carpet, and it is nicely edged. In order to accentuate the greatly increased size of the interior, we have covered the main bulkhead with a good quality mirror. The effect is striking, and gives the look of a much larger interior. By extending the seats across the cockpit underneath the cabin entry, we were able to put a really good mainsheet traveller on the boat without screwing up seating and other usage of the cockpit. The traveller is tucked neatly up against the cabin back, out of the way. The mainsheet no longer hangs across the crew area when the mainsail is let out when running down wind. The traveller gives better control of the shape of the mainsail, with less dependence on the vang. We have upgraded the electrical system, with better fittings and heavier wire. The deck liners have molded-in runs that allow dealers and owners to install wire to all areas where it might be needed for extra lights, instruments, etc. The old boat had 2 interior lights, the new boat has 4. There is one over the front V berth, in the head, in the main cabin, and over the rear berth. We have always used white interiors, and the new boat is a big change. The liners are tan, as are the upholstered hull sides. The cushions are a medium tan, and the carpet is a darker brown. It looks great. The new mast raising system is shown in the brochure. We us a small brake winch to raise and lower the mast, and a set of removable wire cables to keep the mast centered as it goes up and down. The new system requires a lot less effort to raise and lower the mast, and tends to keep the mast centered when it is going up and down. It doesn’t use the halyard, and is not dependent on having the halyard properly cleated down. The line going to the bow of the boat is a fixed length, and does not require guessing at the proper angle of the pole. We are working on a self tending jib option, that can be added to any new 26 at a later date. This will greatly simplify sail handling. Since there are so many combinations of possible headsails, you have a choice between a working jib, genoa or the proposed new self tending working jib (which is slightly smaller than the working jib, because it cannot overlap the mast). In addition, each of these requires a choice of having snaps for hanking on to the forestay or with a luff tape for use with a furler. You can pick the best combination for your type of sailing. We have installed heavier axles, springs, wheel and tires to bring the trailering capacity to 4200 pounds. There is more fender clearance, better support for the hull, and more effective surge brakes. We now have big stainless steel disc brakes, and an electronic system that ties into the car lights that automatically disables the surge brake system when backing up. The deeper V hull helps keep the boat centered on the trailer when bouncing down the road. You will be pleased to know that we are now putting a pelican hook on the lifelines in order to make it easier to get in and out of the cockpit. The lifelines are now higher in the cockpit and conform to the new European standards. On the cabin top, the lifelines are wider spaced to give more walking room when going forward. The pulpit is substantially longer, and gives more to grab on the foredeck. An anchor roller is now standard, and the anchor locker is substantially larger to hold bigger anchors. There is no change in the engine mounting system, or the type of engines that can be used. We have, however, widened the engine well area to allow easier bolting of the engine to the transom. The transom is now flush, and a pad won’t be needed between the motor and the transom. We are working on a very high performance, large spinnaker to be flown from a retracting pole extending about 5 feet forward from the bow. This should give really hot downwind performance. Present boats are not yet being delivered with this system, but it can easily be installed on any 26M in the future. The 26x cruising spinnaker can be used on the new boat, and is available as an option. I get asked a lot, “What do you think is the best boat?” I always answer, “What are you going to use it for?” In other words, there are as many “perfect” boats as there are people, which is why I’ve said before that the perfect boat is the one that gets used. Just like you become a better sailor through experiencing a wide variety of conditions and learning to handle them, the more real time you spend on a boat gives you a clearer vision of what’s really important to you. Usually, a person’s second boat is more “perfect” than their first. Their second boat has hand holds down below because in a rough sea, those wide open spaces in their first boat, became a free fall from one side of the cabin to the other without them; that the cavernous cabin they coveted got that way by settees being next to the hull, so there was no stowage behind them for a summer’s cruise; they find that you need someone to belay you as you hang upside down getting lunch meat out of the vast icebox/refrigerator. Just as a Formula One body is pretty simple, then all the strategic bumps and wings are added for optimal performance, what started out as a streamlined hull and deck on the family boat begins to sprout growths of practicality; a system for the dinghy on the back, or just putting it on the deck; a radar arch may appear on the stern; of course a dodger needs to be added; solar panels appear on the cabin top. A myriad of things will be added to make the boat more perfect. Now, after a few years of fine tuning your first boat and enjoying the experiences from her, you want more than you can just add on and decide to move to another boat, but this time you’ll be looking with more knowledgeably eyes. You don’t just see a beautiful work of fiberglass, wood and steel at the dock, but see it in the realistic light of what you really want it to do. It becomes a more practical and informed decision. Is that to say that all the magic is out of the decision. Of course not. Not many boats are sold, if any, without that unknown “smile” factor entering, if not determining, the decision. We are sailors after all, who love floating around at the will of the wind. Even the most practical sailor won’t buy a boat unless it puts a smile on his/her face. It’s still fulfilling the dream.